But what does skincare really look like for a regular 20-something (read: not a beauty editor)? We asked five women from ages 21 to 29—all with different skin types and routines—to detail exactly how they care for their complexions on a daily basis. Read their stories below. "My skin is definitely dry, acne-prone, and a little sensitive. For example, I always get a collection of little pimples around my brows after I get them done. Since I have an olive skin tone, I get a lot of acne scars, and they take forever to go away. I care a lot about my skincare. I don't like to spend a ton of time on it, but if I feel like a product works really well, I don't mind spending extra money on it. I always use a fancy cleanser. Right now Eve Lom's Morning Time ($60) is working really well. It's not as high maintenance as the original, but it still takes everything off and feels moisturizing. If I'm wearing a lot of makeup, I'll use micellar water to make sure I get everything off. I also like an oily eye makeup remover (I like R.L. Linden's Your Eyes Only, $20) because I think it doesn't tug at my skin as much. Then I use a heavy-ish moisturizer. The cream I was using was clogging my pores, so now I'm just doing argan oil. On top of that, I use Vicco's Turmeric Cream ($4), which has sandalwood oil in it. It actually helps mattify the argan oil, and I think it's helping with my acne scars. "My buying habits are definitely influenced by reviews and word of mouth. I would never buy anything without reading a zillion reviews first. If a friend or family member recommends something—or I read about it on a beauty website—I'm way more likely to buy it. Lately, I've been paying more attention to ingredients. I'm not afraid of synthetics, I just want to know that the products im using have active ingredients in them. "I'm a Clarisonic devotee. I use it every other day in the shower with cleanser. I really like to exfoliate—Kate Somerville's ExfoliKate ($85) is great because the physical exfoliation isn't too grainy, and it has chemical exfoliation too. You can feel it working, so I like that. I also love masks. Origins' Charcoal Mask ($25) is great for a breakout, but I use it as a spot treatment a lot because I'm too lazy to do a full mask; it's a little messy. I also like both of the Glossier masks. The Moisturizing Moon Mask ($22) is great to do before a full face of makeup—everything goes on really smoothly. "I also do these crazy facials in [NYC's] Chinatown. It's not like a spa at all. You're in a communal room and people are talking or snoring. It takes about two hours because they steam you for ages before extracting like crazy. They do a cooling mask at the end, and it even goes over your eyes, so you're not all red from the extractions. I also get microdermabrasion. Not for aging, but because it gets rid of any post-acne roughness and makes my skin smooth. They'll even clean up your brows while you're there, which is nice. "I don't really think about anti-aging. At my age, I know SPF and moisturizing are the best things to do, so I always buy makeup with SPF and moisturize morning and night. I know I should be wearing separate sunscreen, which I'm bad about, but I am good at wearing a hat. I'll sit in the sun, but only if I can cover my face with a big hat and sunglasses." "I would describe my skin as slightly sensitive. Not particularly dry or oily. Fairly standard. "I would be incredibly happy if I never had to wash my face again, but since that is not possible, my skincare is very basic. Wash and go without a doubt. I start my day by washing with Glamglow's Thirstycleanse ($39), and I use the occasional scrub. I end my day by using Burt's Bees Facial Cleansing Towelettes ($12) to take off my makeup. That's the only cleansing I do before bed. I think about anti-aging sometimes and question if I should start taking precautions, but it never materializes beyond sunscreen. "I don't really pay attention to ingredients, but Birchbox is the best because I would never spend a ton of money on a product without sampling it first. Example: Liz Earle's Cleanse and Polish ($26) is everything, and I never would have selected that on my own." "I have sensitive/combination skin. If my skin’s pH is off balance at all, it will soon show up in breakouts and blackheads pretty quickly. I started to really get into skincare and building up my own skincare regimen when I couldn’t get rid of my constant breakouts back in college. I started doing my research and my own personal experiments. It was once I tossed my harsh products full of too many unknown ingredients and begin using a natural, simpler approach to my skincare that my skin improved a lot. Now my two requirements for choosing products is that they need to have natural ingredients that I recognize, and they have to smell amazing. "I always start my skincare regimen by thoroughly washing my hands—it doesn’t make sense to start touching your face with dirty hands. I also take a daily collagen supplement (Sparkle's Collagen Peptide Supplement, $44) and make Kim Snyder’s Glowing Green Smoothie in the mornings to boost my skin from within. "For my morning routine, I will prep my skin with a DIY honey mask to hydrate and place cold spoons over my eyes to depuff. Then I start with an exfoliator to awaken my skin. My current favorite is Frank Body Creamy Face Scrub ($20), which is made with coffee grounds so it has a lovely aroma. I follow that with Klurskin's Rose & White Tea Gentle Glycolic Cleanser ($18) to cleanse my face and Thayer's Witch Hazel Toner with Rose ($11) to tone. I spray my entire face generously with Evan Healy’s Tulsi Holy Basil HydroSoul ($29) and pat on Evan Healy’s Rosehip Facial Serum ($29) with my palms. After that, I apply a small amount of Eminence's Clear Skin Probiotic Moisturizer ($41). Then I seal my pores with DIY green tea and honey ice cubes that I run over my face. The coolness instantly tightens and refreshes my skin. "If I am not going to wear any makeup that day, then I will finish Elta MD's UV Clear SPF 46 sunscreen ($24). But if I am, I will use Dr. Jart+ Black Label Detox BB cream ($36) after I moisturize because it has SPF in it too. For my night routine, I double-cleanse with Evan Healy’s Tea Tree Gel Cleanser ($31) and the Thayer's toner. If I'm up for a mask, I'll use Aztec Secret's Indian Healing clay ($8) mixed with Bragg's Apple Cider Vinegar ($10). I finish with some moisturizer, and Evan Healy's Chamomile Eye Cream ($32) and One Love Organics' Skin Savior ($49) for my lips. If I have a blemish, I use tea-tree oil mixed with a little bit of coconut oil—both have antibacterial properties. "My approach to anti-aging is mostly preventative, like always using sunscreen and putting on eye cream. But I am just starting now to seek out products that are anti-wrinkle or are for firming. I am currently using Korres's Black Pine Active Firming Sleep Oil ($62) a few times a week at night. "In the end, I pay quite a bit of attention to ingredients, because I don’t want to put anything on my face that isn’t natural. And after reading Adina Grigore's Skin Cleanse ($17), it’s become more of a habit." "I try to keep it simple and quick, but it's important to have a consistent routine that keeps breakouts and oiliness at bay but also won't irritate my skin (which causes more breakouts). I pay attention to word of mouth and products recommended by magazines (print and web) while also taking cost into account since I am on a tight budget. "I start the day with Stacked Skincare's Hyaluronic Acid Hydrating Serum ($150) (which was a gift! ), followed by Simple's Replenishing Rich Moisturizer ($9), and Supergoop's Daily Correct CC Cream ($32) as a makeup base. Before bed, I use pharmacy-brand makeup remover wipes, and properly wash my face with Yes To's Tomatoes Activated Charcoal Cleanser ($10) while I'm in the shower. After, I use the same serum and moisturizer as the morning and Trader Joe's tea-tree oil as a spot treatment if needed. "I occasionally think about anti-aging but not enough to do much about it or spend a lot of money on it at this point, other than using the hydrating serum and making sure I wear SPF on my face every day. 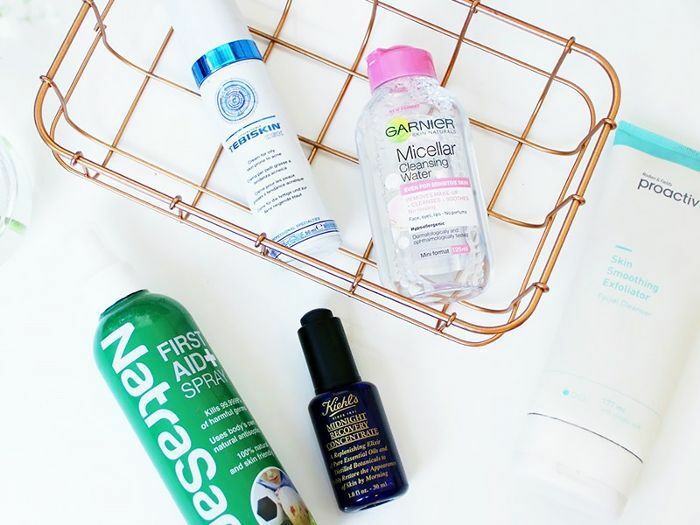 But finding products that will keep my skin clear while not backfiring by irritating it has been a constant battle that I've recently started to get a handle on. Part of what I found to help was keeping medicated acne products (salicylic acid/benzoyl peroxide) to a minimum and sticking with simpler, gentler products geared toward sensitive skin." "My skin is dry, with extra emphasis during the winter. (I live in New England.) Skincare has always been important to me, and as I've gotten older (and seen signs of aging), it's something that I continue to grow obsessed with and more diligent in actually doing, instead of just using the fancy bottles as decorative medals of my adulthood. "In the mornings, I wash my face with Shiseido's Foaming Wash ($23) and then apply an Aesop Facial Toner ($39). Then I mix a little bit of Kiehl's SPF 30 ($31) with Kiehl's Face Cream ($47) and a drop of Kiehl's Daily Reviving Concentrate ($46). Under my eyes, I apply Kiehl's Avocado Eye Cream ($29), which gives me super powers. "At night I wash my face with a Clarisonic brush then do the duo of Glossier face masks. After that, the same toner and moisturizing combo as my morning routine (minus the SPF), this time with Kiehl's Midnight Recovery Serum ($46). "I used to not pay that much attention to aging, and may have actually duped myself into believing that with the skincare regimen I now have I could avoid the inevitable, but I can't! Now I'm super cautious with SPF, even on gray winter days. It turns out the whole world wasn't lying when they said SPF was necessary to combat signs of aging. I pay attention to ingredients wholeheartedly, but let's get real: As I continue to age, if somebody had some sort of moisturizing miracle made of kryptonite, I wouldn't be opposed to slathering that one on too. But I think my next addition to my skincare regimen will be overnight hydrating masks, because this winter has been tough on my skin." Do any of these skincare routines look similar to your own? Tell us about your favorite products and tips in the comments below!